Dave McGinnis, is a veteran a NFL coach. 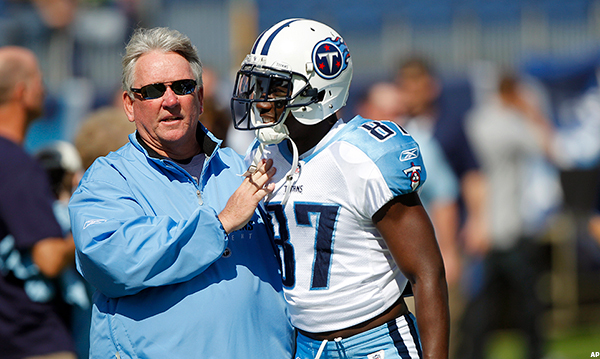 McGinnis served as linebackers coach/assistant head coach with the Titans from 2004-2011. he most recently served as an assistant with the Rams. One of the most respected defensive minds in the game, McGinnis directed the Cardinals defense as their defensive coordinator from 1996 to 2000. He guided three Titan linebackers to new career heights – Keith Bulluck, Stephen Tulloch and David Thornton. Each of the three reached career-high marks in almost every category under his tutelage. In 2009, Tulloch registered a team-high 132 stops and two sacks. Bulluck logged six of his eight consecutive 100-tackle performances under McGinnis’ tutelage and finished second on the franchise list for career interceptions by a linebacker (19). Thornton recorded two of his three 100-tackle seasons with the Titans and forced seven fumbles. In both 2007 and 2008, the Titans finished in the NFL’s top 10 in both total defense and rushing defense. As defensive coordinator in Arizona, he led a group that produced three Pro Bowlers in Aeneas Williams, Eric Swann and Simeon Rice. Rice also earned AP Rookie of the Year honors in 1996 and tallied 51.5 sacks in his tenure with the team, including a franchise record 16.5 sacks in 1999. McGinnis’ 1998 defense helped lead Arizona to the playoffs and ranked third in the league in takeaways with 39. He totaled 16 wins (16-33) in three full seasons as the Cardinals head coach. McGinnis built his reputation and knowledge during a 10-year stint (1986-95) with the Chicago Bears as a linebackers coach, where he worked with one of the best linebacker corps in the game: Mike Singletary, Wilber Marshall and Otis Wilson. He coached Hall of Famer Mike Singletary for seven of his 12 years in the league with each ending in a trip to the Pro Bowl. During his tenure in Chicago, the Bears advanced to the playoffs six times and the defense finished in the top six of the NFL in defense six times, including a first or second place ranking three times. Prior to joining the NFL ranks, McGinnis spent 13 years in college football with stops at his alma mater Texas Christian University (1973-74, ’82), Missouri (1975-77), Indiana State (1978, ’80-81) and Kansas State (1983-85). McGinnis was a three-year starter as a defensive back at TCU, where he graduated in 1973 with a degree in business management. Born in Independence, Kan. (8/7/51), and raised in Snyder, Texas, McGinnis resides in Nashville, Tenn., with his wife Kim.